There is no doubt that people throughout the world are fascinated by gems and have been since they were first discovered. Their sparkle, allure, color and quality make them very desirable and, it appears, always has. As far back as recorded history gems have played a huge part in cultural and spiritual beliefs as well as community status. One of the most unusual gemstones, however, is hessonite, or the cinnamon stone. Although categorized as part of the garnet family its characteristics, mythological influence and history make it quite unique. Hessonite has been a coveted gem in India for hundreds of years. It is primarily found in what is now Sri Lanka but can also be found in Africa and elsewhere. The Greeks named it hessonite because the word hesson meant “inferior”, which reflected their impression when comparing it to other gems. It was found to be more dense yet softer, and often contained flaws that could be seen with the naked eye. The Greeks and Romans also utilized the stones, sometimes even engraving them to produce pieces of cameo and intaglio. 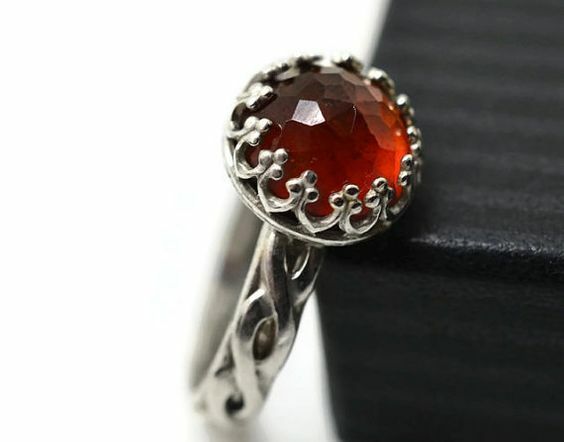 The calcium aluminum silicate properties in hessonite, along with its color, make it one of the more unique stones. It is actually part of the garnet family called grossularite. It can come in colors that includes golden reddish-orange, honey-yellow, yellow-brown and, sometimes, even with pink or green hues. The rarest ever found had no color at all. The gem’s color is primarily due to the presence and quantities of manganese and iron in the stones that appear as though they contain swirls or bubbles. On the hardness scale, they rate from 6.5 to 7, which is slightly softer that other garnets. It usually contains a greasy luster without cleavage and can be found anywhere between transparent to translucent. Because of it’s complexity, it is usually cut into round, oval or mixed shapes. Hessonite was believed to be the planetary gemstone of the Rahu, that caused individuals to face miseries and obstacles along the way to success. It was believed to have been made from the fingernails of a great demon named Vala that only brought trouble to all the gods. When the gods captured, killed and then dismembered him, the various parts became precious stones. The fingernails became Rahu. Rahu was a shadowy, rogue Hindu figure that, when operating, would bring an individual’s karma to bear. The individual would often be negatively affected by politics, anxiety and fear, irrational behavior, problems with spirits or ghosts, the course of dreams including nightmares, professionally, in material gains or losses, diseases and much more. As such, it was only worn during specific periods in the life of an individual when problems existed or when desires were left unfulfilled. Even then, individuals took a chance since the outcome, whether it be good or bad, was unknown. On the good side, Rahu could also help the wear recognize and appreciate their own virtues which would increase self-confidence and reduce laziness. It was believed that when hessonite was set in gold it served as a powerful talisman that would increase the happiness and lifespan of an individual. In quantities larger than two carats, individuals could expect good fortune, success, and wealth. The stones were also thought to stimulate creativity, provide clarity of thought, balance emotions and calm nerves. Physically, it was used to stimulate metabolism, regulate hormones, bolster the immune system and promote good health because it helped the body absorb nutrients from food. Hessonite should only be purchased on Saturday before 10 a.m. and delivered to the jeweler on the same day. The weight should be more than 4 rattikas, 3.64 carats or 728mg. The mounting requires an open back under the stone so it actually touches the finger, and it should only be worn only on the middle finger beginning two hours after sunset. Since hessonite is a softer gemstone, it was often used by individuals of status throughout history. Most frequently, the gems can be found in antique signet rings, also known as intaglios, which were created so individuals could seal important documents with a symbol that identified the writer. Such rings have been found in archaeological digs where Roman artifacts have been found. The carved gemstones were used because the hot wax that was used to make the imprint would not adhere to the stone. It was about the same time that the Greeks and Egyptians also began using the stones in jewelry. All garnets are heat sensitive. When exposed to excessive heat, they can fracture so care is needed when wearing them. All garnets are also sensitive to hydroflouoric acids. These are common in the use of products to remove film from old glass bottles, with offset printing companies to remove unwanted images, in the petroleum industry to extract sandstone from oil, and in geology to remove excess rock from organic compounds. To care for the gems, use an UltaSonic Cleaner, Ionic Cleaner or warm soapy water but avoid steam. It is the gemstone of New York. It is the stone that belongs to Aquarius. Hessonite has been discovered in various sites throughout the world embedded in metamorphic rocks or gem gravels and sand. Because it’s more abundant than many other gemstones, it’s extremely affordable. The St. Barbara Adit, Bohemia in the Czech Republic. Valle d’Aosta in northwest Italy. Chelyabinsk Oblast, Urals in central Russia. Zermatt in the Alpine canton of Valais in southern Switzerland. Okkampitlya in southeast Sri Lanka. It is known to harvest the finest quality of hessonite, many of which are valued as Collectors’ Gemstones. Maine, New Hampshire, California, Connecticut, and Massachusetts in the United States. Hessonite is an interesting stone that is beautiful to look at and has a strong cultural, spiritual and metaphysical background. According to legend, although some bad things may happen to the wearer, the outcome could also be extremely rewarding. The choice is up to those that own it. What do you think? Would it be worth the risk if the outcome were wealth, good health, a long life and fulfillment of your deepest desires? Let everyone know what you think about using this stone in jewelry. Hey Buddy!, I found this information for you: "Hessonite: The Cinnamon Stone Feared by Many". Here is the website link: https://accessgems.com/hessonite-cinnamon-stone/. Thank you.